The U.S. labor market produced a “Goldilocks” moment in August: Hiring was neither too hot nor too cold. Modest payroll growth last month reaffirms the sound state of the U.S. labor market and raises questions regarding whether the Federal Reserve needs to raise its benchmark interest rate when it meets Sept. 20-21. With scant evidence of any overheating in the economy and minimal inflationary pressures accumulating in prices and wages, the central bank’s intentions to normalize monetary policy will likely be postponed. U.S. employers added 151,000 positions last month behind respectable contributions from consumer-oriented sectors including healthcare, retail, and leisure and hospitality. The number came in below expectations and lags the average monthly gain over the past year, suggesting the Federal Reserve may have to yield to caution when it meets later this month. 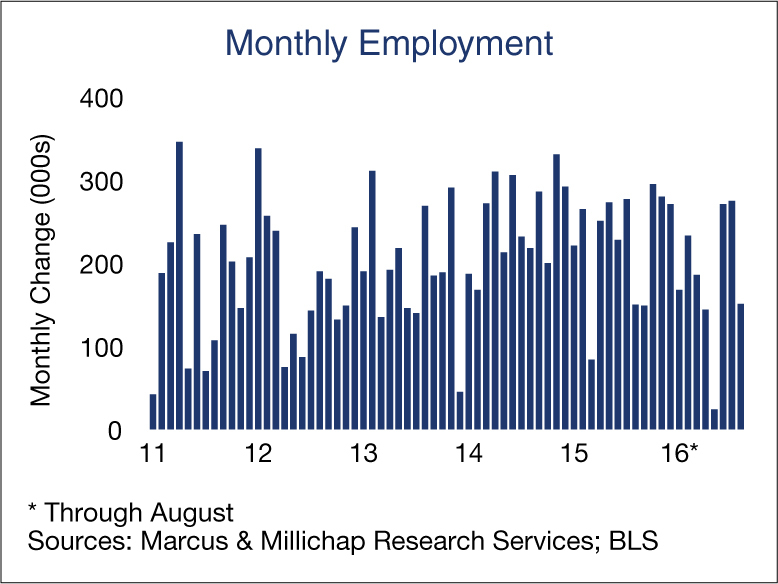 August employment is often revised upward in ensuing months, but a rate hike based on today’s more modest reading would be challenging to communicate and potentially sow unintended consequences in global markets. In addition, wage growth of 2.4 percent over the past year generates little upward pressure on inflation and signals the central bank can wait for wage pressure to build before acting. Labor market slack, a factor considered by the Fed in its deliberations, is stable. The unemployment rate and the underemployment rate were unchanged last month at 4.9 percent and 9.7 percent, respectively. While most labor market indicators are positive, other data releases this week provide fresh examples of the choppy pattern of economic growth that has persisted throughout this cycle and influenced Fed decisions. These include a year-over-year drop in auto sales in August and a disappointing reading of a manufacturing sector index that coincided with a loss of 14,000 manufacturing positions last month. Office-using employment sectors stood out in August, adding a combined 41,000 positions. Year to date, growth in professional and business services, and financial services has accounted for most of the 449,000 office-using posts created. The increase may be exerting pressure on existing space configurations and prompting a consideration of bigger layouts to house larger office workforces. After falling to a post-recession low of 14.8 percent in the second quarter, the U.S. office vacancy rate appears on track to fall further into the mid-14 percent range this year. An average 205,000 positions were created over the past 12 months and the U.S. economy is promoting the creation of new households and stoking new housing demand. Many new households are settling in rentals and vacancy in the national apartment sector dipped to 3.8 percent at midyear. Elevated completions in some submarkets will place upward pressure on vacancy rates in some metros, but the U.S. rate will likely remain unchanged at 4.2 percent at year-end as demand aligns with supply growth. This entry was written by marcusmillichap, posted on September 2, 2016 at 7:54 pm, filed under Research, Uncategorized and tagged CRE, Economic Growth, Economy, Employment, Marcus and Millichap, research. Bookmark the permalink. Follow any comments here with the RSS feed for this post. Post a comment or leave a trackback: Trackback URL.